Why do leaders from companies like Deloitte, GE, and Ritz Carlton trust their presentation coaching to someone who forgot his name the first time he spoke to a group? Three words... Results. Fast. Guaranteed. Regardless if you present in person, on the phone, or over the Web, the way you present yourself and your message is critical to your success. Since 1988, we have catered to top business leaders, as well as technical and sales professionals who want to become extraordinary communicators and stand out from the crowd. We do this through completely customized private executive speech coaching and group presentation skills workshops at your location or ours, and sometimes we work together by phone, video, or online meeting. My team and I know firsthand what it takes to connect with diverse audiences and have coached professionals, from Savannah to Singapore, in virtually every field, whether they are addressing senior leaders, fellow employees, clients, investors, boards of directors, the media, or the general public. I’m confident that we can help you, too. In fact, I guarantee it. Contact us and let’s have a conversation about your needs and how we can help you. Yes, it’s true. The first time I spoke to a group was back in junior high school—Mrs. Weir’s Sixth-grade English class. Oral book reports. I approached the front of the room, clenched the lectern for support and managed to squeak out five words: “Good afternoon, my name is.” I completely froze, forgot my name, and never even started the book report! 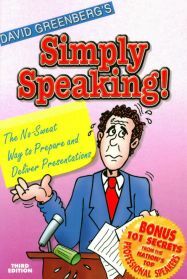 Years later I discovered that if one learns how to prepare, practice, and truly connect with listeners, public speaking could be a wonderfully rewarding experience. I studied the best communicators and, though still nervous, I sought every opportunity to speak. Eventually I won several speaking competitions. In 1988, Toastmasters International honored me with the title “State’s Best Speech Coach” and my company, Simply Speaking, Inc.®, was born. Oglethorpe University in Atlanta hired me to teach their executive presentation skills classes and people from all types of organizations called me to help them improve their communication skills. A decade later, the National Speakers Association honored me with their highest-earned award, the “Certified Speaking Professional.” The CSP designation is held by less than 7% of the organization’s 4000 professional speakers and it is your assurance that you are dealing with a proven professional, dedicated to your success. During the past three decades I’ve assembled a team of stellar coaches. Together we have helped more than 100,000 people from Savannah to Singapore to develop extraordinary communication skills. My goal is not to impress you but to impress upon you that no matter where you or your team may be on the spectrum of communication skills, with the right tools, the right coach, and the right support, virtually anyone can be a highly effective and respected communicator. Contact us and let’s have a conversation about your needs.